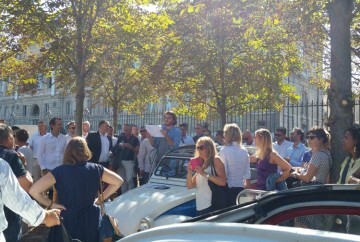 A Paris Authentic 2CV rally in the city is an unusual way to discover the capital while having fun. It consists of a competitive orientation trail and quiz with Polaroid photos. Each team’s ‘road book’ is individual so that one team can’t just follow another one. 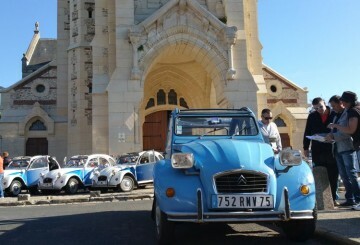 The series of stop-offs and associated questions lead the teams not only to travel by 2CV to lesser-known parts of Paris but also to get out of the car to find the answers. The content has been devised so that iPhones and other smartphones can’t be used to consult the internet for clues. More than a simple visual game about discovering Paris, or mere entertainment, the rally is a team competition that finishes with one team being declared winner: the one which gains most points by best answering their questions in the ‘road book’. Have you counted the steps of the Arènes de Lutèce? Do you know which statue can be found in the public garden of the church of St Germain? How many cannons are there in front of Les Invalides? What’s the price of a kilo of Parisian honey, cultivated on the roof of the Garnier opera ? All the questions are linked to the culture and history of Paris. 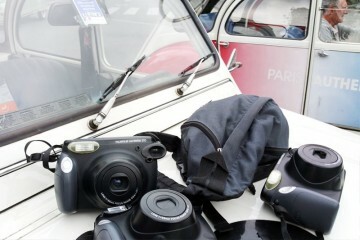 A Polaroid photo challenge also takes place at each stop-off point. In a spirit of fun, shots are asked for such as ‘three team members on a Vélib’, ‘a photo of Tarzan’ or ‘a zany photo’. The pictures count towards the team’s points and, as memorable souvenirs, are given to the teams at the end of the rally. Each team member gets what they want out of it : discovery for some, challenge for others, finding out about Paris, a quirky activity ... it’s really good fun to be shared by everyone.